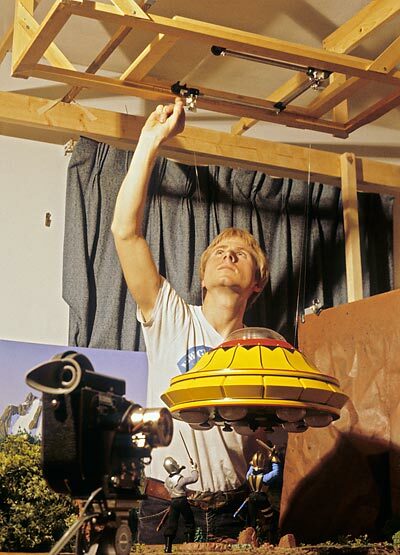 Let's take a journey in the “way-back machine” to 1982, when I was busy creating a stop-motion world in the spare bedroom of my apartment. 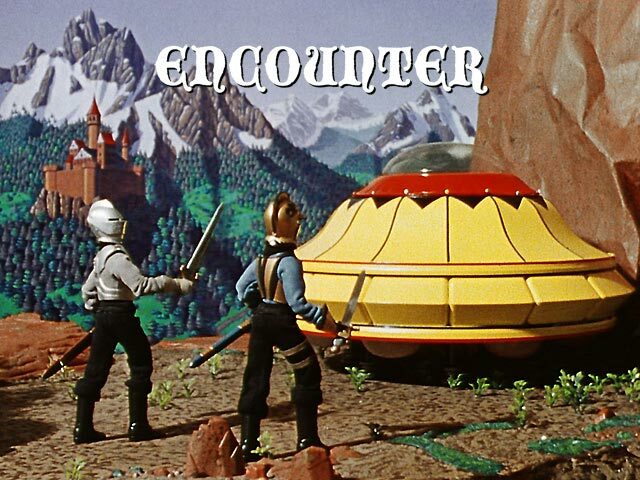 Having previously filmed numerous animated experiments, I devised the methodology for a more ambitious project, Encounter, about a confrontation between knights and aliens in the Middle Ages. Information about the stop-motion process was very scarce in those days, but I managed to figure out and find ways that would work within the confines of low budget independent filmmaking. 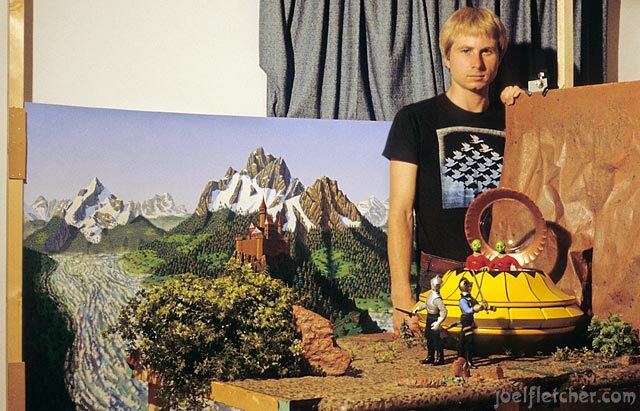 "A painting brought to life" was my goal for the look of the film. What better way to start than with the background painting of a mountainous landscape complete with the requisite castle! The painting alone took months to complete, done with acrylic on a 4' by 8' sheet of hardboard. The tabletop set of a cliffside overlook was built of wood, cardboard, artificial plants, and a few real rocks. It was given a paint job to match the style of the background painting. Armature technology was beyond my means at that time, so I utilized jointed Mego dolls as a starting point for the characters. The dolls, or should I say "action figures", were radically changed in appearance with new outfits, heads, and hands. Creating the alien spacecraft was a particular challenge because it had working landing gear, lights, and a dome. I kluged it together from cardboard, craft store items, some hardware, and various objects that I found. I wrote the script keeping in mind the need to make any limitations work to my advantage. 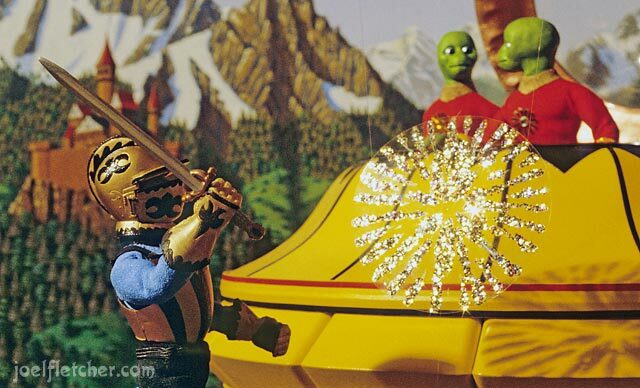 For instance, the aliens only spoke telepathically and the knights wore face-covering helmets which completely eliminated any need for lip synchronization. All the story events that happened were written to accommodate my very small stage. The dialog was recorded at a PBS station, WHA-TV, as part of a special grant that covered both pre- and post-production of the project. I did the track reading of the recorded dialog and transcribed the timing to X-sheets for the upcoming animation. In preparation for the shoot, I built an overhead support system using lumber for the lighting and flying rig, then constructed another support to hold and conform the background painting into a curved cyclorama. To simulate sunlight, I attached a single Lowel light to the overhead support, conveniently keeping it out of the way of the animation process. Finally, I built a flying rig, or "aerial brace", from wood and metal, using guitar machine heads to spool the wire which would be used to "fly" the saucer and other props. The heart of the whole process, the stop-motion animation itself, was filmed with my 16mm Bolex camera, equipped with a Stevens animation motor. My film stock of choice was Kodak ECO (Ektachrome Commercial), a product that had saturated colors similar to Kodachrome. Using the dialog X-sheets to guide the character performance, I animated the shots in my spare time, on nights and weekends. Since I did not yet know how to use surface gauges, I posed the puppets completely by eye. Surprisingly, I was able to achieve a reasonable quality of movement from them considering their humble construction; however, the knights, in rigid boots, had no ankle flexibility which made their walking look stiff and awkward. After completing each shot, I took a Polaroid photo for reference and made notes about the direction of movements. This step provided a safeguard in case a shot went wrong and needed a re-shoot. The spacecraft, weapons, and force-field effect were suspended with monofilament fishing line. The force-field was actually a series of acetate cells with gold glitter, carefully angled with an aerial brace to reflect the light source to the camera. I would keep shooting until a full roll of film had been shot, but often a month or more would pass before the film could be processed and I would be able to see the results of my efforts. How different it is today with the instant gratification associated with the use of digital cameras! All the difficulty was worth it, however. I still love the process of bringing inanimate objects to life using the synthesis of painting, sculpting, storytelling, and photographing to create the animating technique we know as “stop-motion”. After three months of animation, the shooting had been completed and I was able to begin the post-production phase. The editorial department at WHA-TV did a great job of assembling my shots, adding sound effects, mixing a final soundtrack, and providing the final print. The final product was broadcast on television as part of a collection of my earlier films. Flash forward to 2009. Desiring a modern digital version of Encounter, I decided to have a 1080p telecine made from my original film. After nearly 30 years, the colors had shifted toward magenta, but the technique of color correction was able to restore it to its original glory. I added some intro and outro music by Bjorn Lynne to give it a touch of mystery. In a way I would never have dreamed possible in 1982, my film is now back from obscurity and online for a whole new audience to enjoy!